As many of you know, a lot of my time has recently been taken up (amongst other things) by my little store project, Crypsis. Well I purposefully try not to toot (lol toot) my own horn too much on Grey Ops, cause I like to keep things separate, but I'd love some feedback from those of you that have checked out the site (and those that haven't). So, you have opportunity to win some swag and make Crypsis better at the same time. Details below the pic/break. Answer at least the two mandatory questions (one being your email, allowing me to contact you with the offer of free stuff). 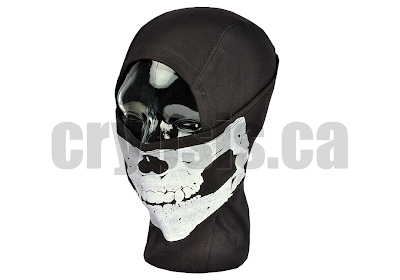 You'll then be entered to win: 1x Black Skull Balaclava (show above) 1x Paracord bracelet (built to your specs) and 1x Mystery patch that nobody else has seen yet. Answer all the questions and I'll enter you twice! I'll probably end the contest in a few days to a week, and I'll contact the winner via email. Thanks for your participation, and please spread the love/hate!